I am in West Palm Beach for a client meeting. 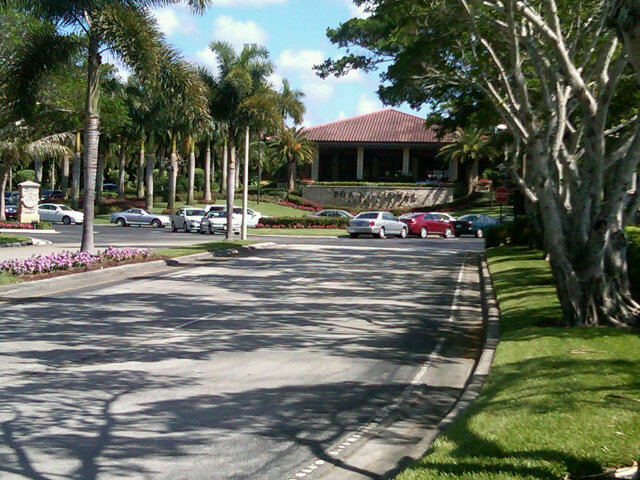 They've put me up in a very nice PGA National Golf Resort and Spa. It's true what they say about West Palm Beach. It's full of old rich white guys. I sat and watched 5 of them in the gym argue about how the value of the dollar is ruined and that the time to buy futures is for September while watching a tennis match. I don't know if it's true, but then they went into talking about condo convenants and if one guy is getting screwed by his home insurance company because they raised his rates and they're charging him for stuff that's already covered by his condo association. Oh the troubles these people have while they wait for their tee times. The whole resort and spa thing is wasted on me. I don't really like the spa stuff and I can't play golf. I've been to the driving range a few times, but there is NO WAY I am bringing that embarassing swing to this driving range. They have a racquet club here, but I didn't bring my racquets, so I just sat by the pool for an hour or so. They have some crazy fluffy clouds here and the sun was going in and out of it. It wasn't like Vegas where it was super hot, just sunny and breezy. I might have been out there too long because I got some weird tan lines and I think I burnt myself. Oh well, I don't see the sun much otherwise so it'll be ok. I'm here to work anyway, but next time, I have to learn to hit a golf ball so I can look respectable to be able to say I've hit a ball on a PGA course.